We love travel. We love experiencing new people, new places — opening our minds to how excitingly varied the world can be. Unfortunately, this time of year in particular, travel often means exposing yourself to some not-so-pleasant things. Namely other passengers’ germs. Here in the United States, we’re in the midst of a particularly intense flu season. According to the latest data from the Centers for Disease Control and Prevention, the icky illness is ‘widespread’ across 48 states. The flu hasn’t seen this much attention since 2009’s H1N1 outbreak. During the 2009 H1N1 epidemic, researchers seized the opportunity to take a look at how influenza-like-illnesses spread on long-haul flights. Study author Dr. Paul M. Kelly, an associate professor at Australian National University in Canberra, says the “danger zone” for flu transmission is actually about two seats in each direction — two rows in front and behind you as well as two seats on either side. “Change seats if you find yourself within two seats of someone who is sneezing, coughing and looks like they have a fever,” Dr. Kelly says. 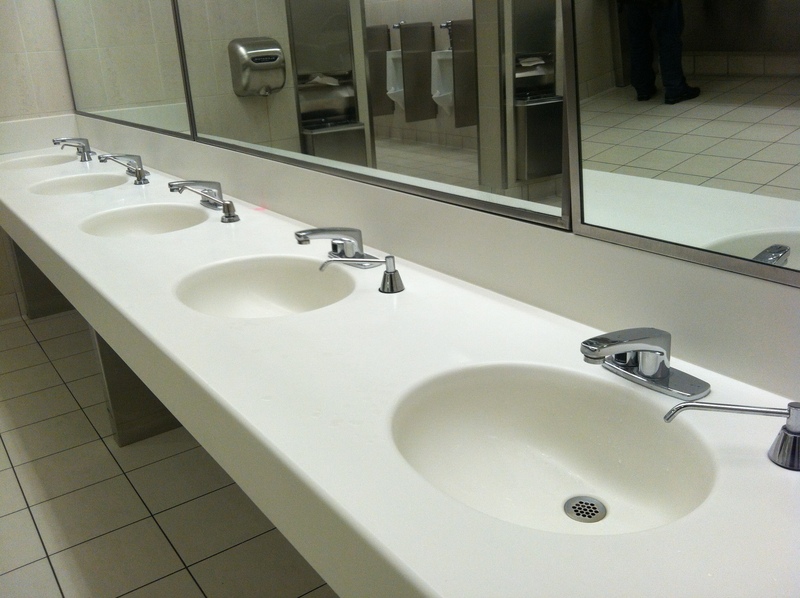 Use these sinks and the (itty bitty) one on the plane — often. Experts say washing your hands — well and often — is a great way to stay healthy whether you’re in the air with a couple hundred of your closest “friends” or running around at ground level; and that’s whether anyone around you looks sick or not. Wash your hands often and show fellow travelers you have their health in mind by bringing tissues and hand sanitizer on the flight. When stuck in a tight, crowded space, turn away from others—or better yet, move away if you can—and cough or sneeze into your elbow or a tissue. Your seatmate will appreciate the extra effort! Acknowledging that you know they’re sick (and truly can’t help that nagging cough or the sniffles) shows a little compassion. Most people will respond by at least trying to contain their germ-fest.